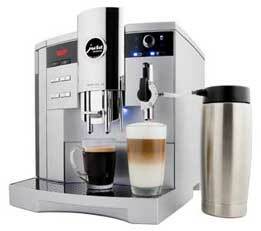 Why should you buy a JURA CAPRESSO Super Automatic Coffee Center from 1stincoffee.com? Simply because you love coffee…and you can’t buy a better, more reliable machine! 1. Jura-Capresso Automatic Coffee Centers make the freshest, most aromatic coffee, espresso, cappuccino, and latte completely automatically. 2. It’s like having a coffee Barista of your very own! 3. Each cup of coffee is made on demand. 4. All you have to do is press a button! 5. Coffee is ground for each cup just before brewing, preserving more aroma than any other brewing system. 6. The coffee can’t be fresher! 7. Our 18 bar pump easily forces hot water at high pressure through the grounds extracting flavor and aroma in less than 30 seconds, leaving behind all bitter chemicals which are normally extracted during a longer brewing methods. 8. The coffee can’t taste better! 9. All our Automatic Coffee Centers have an extra large brewing chamber, which holds up to 16 grams of ground coffee… more than any other system on the market. This design allows you to brew up to 16 oz. of coffee at a time. 10. The choice is all yours: One or two espressos, one or two double shots, two double shots, a 12 oz. mug or any other combination of up to 16 oz. of coffee at a time. 11. Our high-wattage stainless steel lined ThermoBlock heating systems deliver unlimited amounts of steam for frothing and steaming milk for cappuccinos and lattes. Some of our models even froth the milk and brew the coffee with just one push of the button (look for our One Touch Cappuccino models Z6, Z5, S9 One Touch, C9 One Touch and Z7 One Touch). 12. Making cappuccino and latte was never this easy! 13. 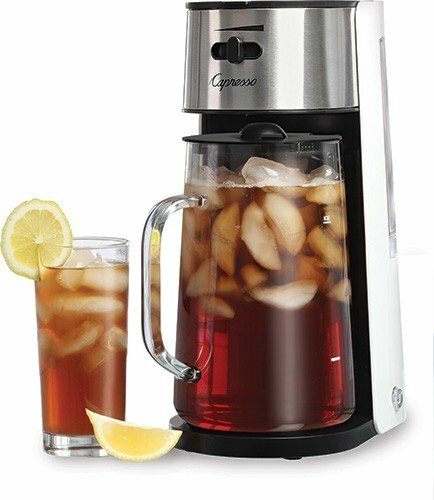 A hot water dispenser is ideal to quickly pre-warm cold cups or prepare a large cup of tea in seconds. 14. All our Automatic Coffee Centers can be operated in stand-by mode all day long, ready to make a cup of coffee in seconds. During brewing you can even change the strength and the coffee volume without changing your regular setting. 15. The 60-second cappuccino, anytime you want it! 16. User friendly and informative alpha-numeric displays inform you when its time to refill water and beans and to clean your machine. 17. It’s as easy to clean as it is to make coffee! 18. Made in Switzerland: All Jura-Capresso Automatic Coffee Centers are made of high-end quality materials. The built-in commercial conical steel burr grinder with its class leading low-noise design is manually calibrated during assembly to assure highest precision grinding. 19. You can’t buy a better, more reliable machine!